Don’t say to yourself that you can not memorize because of your bad memory. Because to improve a bad memory, you need to memorize anyway. Believe in yourself that you can! Battle the bad with the good. Your efforts will be rewarded even if you end up memorizing just one verse by the end of the day but DON’T give up. Say to yourself, I CAN & I WILL in shaa Allaah! Watch videos about the Qur’an and the reward of reciting, memorizing and studying it. 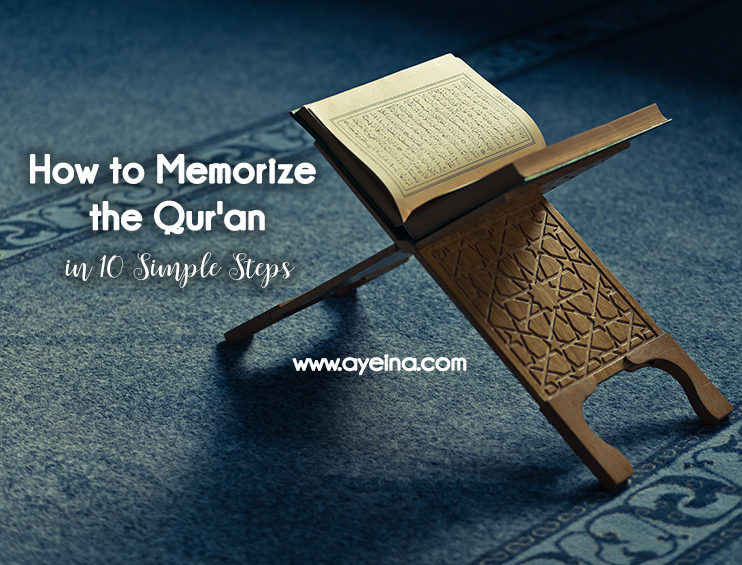 Learn about people’s experiences memorizing the Qur’an to stay motivated. Regardless of your age or profession, you still can do it. There are hundreds of stories that will inspire you to take your first steps in this journey bi’idhnillah. Here is a story of a woman who completed her memorization of the Qur’an at the age of 82! If you set your mind to it, start today and don’t delay. Start with baby steps. Start by listening alone. Listen to the verses on repeat, till they roll on your tongue automatically. Listen to them while traveling, driving, cooking, cleaning etc. It’s preferable that you stick to one qaari (reciter). Listening also helps keep your tajweed right. 2) This website also gives you an option of recording your voice and listening to it on repeat. 3) This website has divided the recitations by surahs, juzz, pages etc. Once you are done with the listening part for few days or hours (depending on every individual), take the special timeout (could be few quality minutes as well), keep the Quran in front of you to see the text while you listen to the verses. Remove the distractions around you – like mobile etc. Divide the pages into parts and keep reminding yourself of the reason as to why you’re memorizing in the first place. Don’t forget to memorize the translation with it for better understanding. Understanding is half memorizing. Try utilizing the pre-Fajr or post-Fajr time when your mind is the most fresh and ready to absorb the most. Train your brain with an impression of the text. Stop and picture a scene in your mind to make the impression stronger. Some people say that memorizing from the same Quran/Mus’haf helps them. So you can use a pencil to mark words, underline verses and personalize your Qur’an – whatever makes it easier for you to memorize. Try to get a standard size Qur’an, not too big, that you can’t hold and take it everywhere you go, and not too small, that will be hard to memorize from, and you won’t be able to write on it. Link the text to something you already know and link the habit of memorization to something you already do. For eg: you drink coffee/tea each day – then associate that time with your memorization time so you are regular in memorizing just as you are regular in drinking tea/coffee. Repeat with your tongue (aloud) – The more you repeat, the more you remember. Memorization is easier in the early morning when your mind is fresh. Don’t take such long breaks (a week or so) that it makes you lazy and distracts you from your goal. 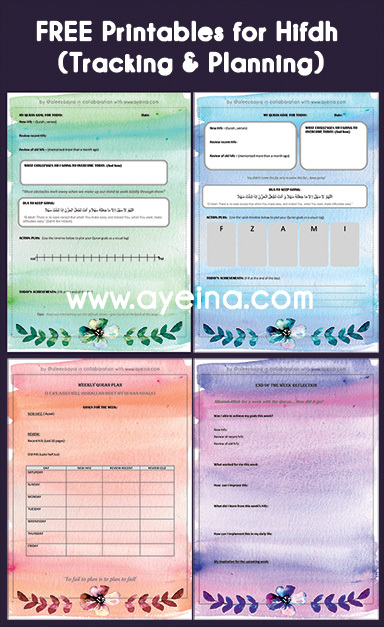 2) You can register here to keep track of your hifdh (basic tracking is free). 3) You can also print these freebies out. Once you have memorized them, recite them in your prayer. Break them down to five verses or so each rak’ah for ease. Practice makes a person perfect. Consistency is the key. Try not to start your new lesson until you’re finished with the revision of a previous one. Keep your mus’haf (copy of the Qur’an) with you at all times. So you can catch whatever time you may have. Make someone take your oral test – preferably regularly. Be it a teacher, sibling or a friend. Have an accountability partner with you who will not only keep you motivated, but also test you from time to time. You can’t always do it all on your own. It’s even better if someone is memorizing with you as both of you can keep each other motivated. For some people, writing the verses down after memorization helps as well. There is nothing like application of knowledge that strengthens whatever you have learned. And then teaching it forward makes the memory stronger. *Edited with the help of a friend who is currently memorizing the Qur’an – Hafsa Baber. JazahaAllahu khair. These are great tips. I find that after I had my daughter it is a lot harder for me to focus and memorize. I am going to work on listening more often as I can do that WITH my daughter! Listening can be such a passive learning. I ended up memorizing so many surahs that I did not intend to memorize even. But I must warn, the moment you will lose the tone/rhyme of the Qari, you will lose the words as well lol.